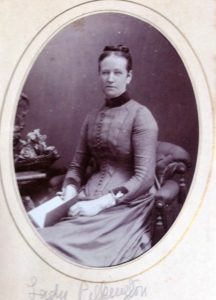 Martha Shaw was born on 11 Nov 1830 in Blackburn the eldest daughter of Henry Shaw Esq,, brewer, and was baptised on 20 Jan 1831 in Chapel Street Independent Non Conformist Church in Blackburn. Her mother died when she was only 4 and her father remarried and continued to build a substantial brewing business in Blackburn. 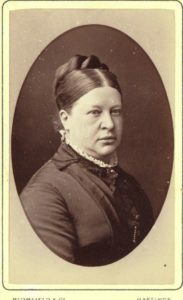 Her first marriage in 1853 was to William Pilkington, a Blackburn Cotton Mill owner some 20 years her senior and gave her no children. William Pilkington died in 1878 and she moved to Buxton where her widowed step mother had seemed to have retired to. She married Henry John Marten on 5 Oct 1880 at St John’s Buxton and moved to the Birches in Codsall. The unmarried Florence and Nelly Marten were presumably still at home. Both step daughters were to marry in 1889. A number of Martha’s Pilkington and Shaw relations figure in the list of guests at the wedding of Florence Marten and Henry Evans. They also feature prominently in Florence Marten’s photo album, that may suggest that her stepmother Martha was instrumental in helping her compile the volume. Mary Elizabeth Pilkington was Martha’s niece, the daughter of James Pilkington, her dead husband’s brother. She had married George Augustus Coombe in 1878 and they are the Mr and Mrs Pilkington on the wedding list. The family had all changed their name by deed poll back to Pilkington in 1882. George Pilkington was knighted in 1893 making her Lady Pilkington. Lady Pilkington’s two daughters by a previous marriage (Flynn), Mary Jane and Ethel attend the wedding, the elder as bridesmaid. Martha Shaw died at the Birches Codsall on 2 Jul 1900. Her stepson Edward Dimmack Marten obtained probate on an estate of about £30,000. The Pilkington inheritance of some £144,000 from the Blackburn Cotton mills passed directly to Lady Pilkington and the Gartside-Tipping family when Lady Pilkington’s father James Pilkington died in 1890, aged 86.